Fr Nicholas Schofield over at the Roman Miscellany has a report on today's Blessed Sacrament Procession organised by four parishes in North London. 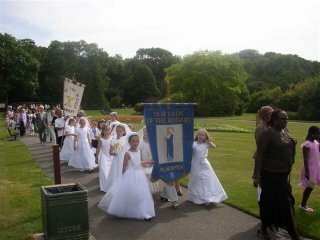 Brother Lawrence has some photos of the procession held at Blackfriars, Cambridge on the feast day itself. We will be having our Blessed Sacrament Procession next Sunday for the Deaneries of Bexley and Greenwich. If you are in the area, it starts at 3pm at the ruins of the old Lesnes Abbey in Abbey Wood. The photo here shows part of the Blackfen contingent at last year's procession. Today at the Angelus, Pope Benedict had something to say about the custom. As ever, it is thought-provoking and insightful, offering an original slant. The Eucharist has a cosmic value: the transformation of bread and wine into the Body and Blood of Christ constitutes the principle of divinization of creation itself. That is why the feast of Corpus Domini is characterized particularly by the tradition of carrying the Most Blessed Sacrament in procession, an act that is rich in significance. By carrying the Sacrament in the streets and in the squares, we wish to immerse the Bread that descended from heaven in the daily routine of our life. We want Jesus to walk where we walk, to live where we live. On this day the Christian community proclaims that the Eucharist is for everyone - it is life itself, the spring of life which conquers death. From our communion with Christ the Eucharist, comes that love which transforms our existence and supports our journey towards our heavenly Home.